Hey there! 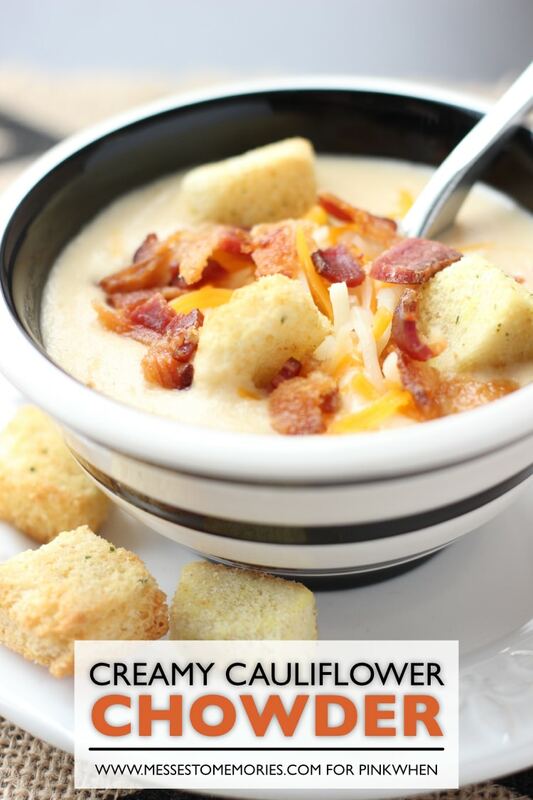 It’s Carissa and I’m back and excited to share another one of our favorite recipes…Creamy Cauliflower Chowder. This is actually a recent discovery, but I love it so much I just have to share… My husband is pretty crazy about it, too! Creamy Cauliflower Chowder–A thick, creamy soup that will fill you up and make you feel sooo good because it is actually good for you! Soup season is almost over, which makes me kind of sad. We’ve discovered some really great soups this season like this Corn and Cauliflower Chowder and enjoyed some of our family favorites like this Taco Soup. This soup was inspired by one of my favorite restaurants–Zupas! My husband and I grabbed soup and salad there a lot while we were dating. He frequently tried new soups like this Creamy Cauliflower Soup. I wasn’t a huge fan then. I had something against cauliflower… a mental block if you will. Recently we discovered that cauliflower can actually be really delicious. In an effort to eat healthier, we decided to try out some cauliflower. Since we opened our minds to cauliflower we have had some really delicious meals. Which proves that you should always be open to trying new things. 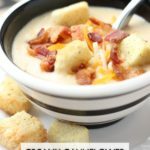 This is a creamy, dreamy soup that reminds me of my favorite comfort foods, but I can actually really enjoy a bowl full because I know that its good for me too! Creamy Cauliflower Chowder--A thick, creamy soup that will fill you up and make you feel sooo good because it is actually good for you! Add butter, garlic, onion and cauliflower to a large pot and saute for 5 minutes until cauliflower starts to brown. Add flour, chicken bouillon, ground mustard, paprika, salt and mix well, then add 2 cups milk and stir. Reduce heat and boil for 10 minutes, cauliflower should be soft. Add to a blender and blend until smooth. Transfer back to the pot and add the rest of the milk. Add parmesan cheese, cheddar cheese and stir until melted. When cheese is melted and its heated through, serve in bowls and top with bacon, croutons and extra cheese. When you sauté the cauliflower, make sure you don't over brown. Come check out some more family friendly recipes on Messes to Memories! How about a delicious Balsamic Chicken Salad to pair with this dreamy soup! ?